Proper functioning of voice communications systems is crucial for the safety of aircraft passengers and the continuity of air space operation. The quality of communications plays an important role since clear understanding is key for safe and seamless operation. By introducing state-of-the-art VoIP communications technology, ANSPs take advantage of the benefits of IP-based communications, such as higher availability, security and flexibility. Voice over IP is one of the most demanding IP-based services to date. To ensure the same user experience as in digital networks, minimum requirements were specified in ED-136 and ED-137. The standards require an MOS above 4.0 and an end-to-end delay not larger than 130 ms. Experience from the carrier and enterprise sectors shows that quality monitoring is necessary to assure such requirements. Rohde & Schwarz adopted carrier grade VoIP monitoring systems for quality measurements within ATC voice networks. The Rohde & Schwarz ATC voice quality assurance system (R&S®AQUA) gives air traffic service providers and airport operators (ANSP) full control over their voice service quality. Its market-leading monitoring technology provides deep insights into media and control plane traffic. R&S®AQUA combines powerful analytics and reporting capabilities with a highly scalable system architecture, making it an essential tool for any ANSP. The ED-136 conformity report can also be provided to the local Civil Aviation Authority as proof of proper system operation. Flawless operation of the underlying IP network is essential for proper voice delivery. 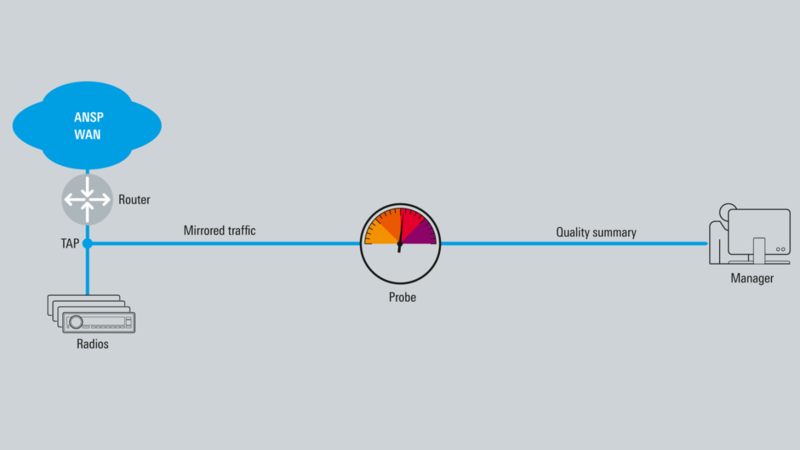 Monitoring of network performance metrics helps determine the actual transport quality. 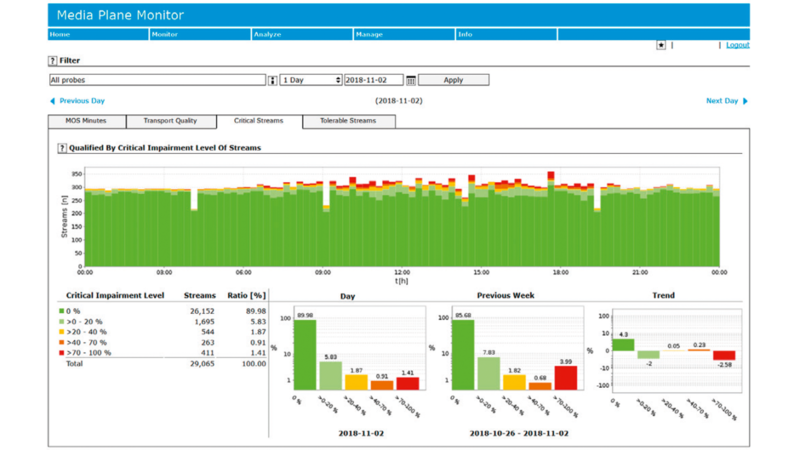 R&S®AQUA provides all relevant information for performance monitoring of an IP-based voice network, including transport performance metrics such as jitter and detailed packet interarrival time histograms, packet loss, burst loss data and loss density, round-trip delay and transport policy data (e.g. VLANs and DSCP code fields). Based on those parameters, R&S®AQUA automatically determines and indicates the root cause for various types of transport impairments. This significantly shortens troubleshooting time. R&S®AQUA provides a rich set of service quality metrics and KPIs for the control plane, i.e. for SIP based signaling. Most of these KPIs, such as the session establishment effectiveness ratio (SEER), are based on IETF RFC 6076. This is primary information for the evaluation of ground-ground communications, but also for radio availability within the air-ground call setup. The signaling quality essentially determines whether it is possible to set up a call at all. Once a call is established, the voice quality defines the user experience, i.e. the quality of the RTP flows. R&S®AQUA analyzes each RTP stream in real time and assigns mean opinion scores (MOS) to every 5-second segment of a stream. This unique fixed time slicing approach is recommended to account for the varying nature of voice quality in IP networks. It also perfectly corresponds to the typical length of communications commands in ATC communications. Conventional averaging per call or connection leads to a significant loss of information. For example, the average quality of a perfect one-day connection that suffers from severe impairments in the last 5 s will be close to perfect, but the controller will complain about bad quality. Averaged metric data does not even help troubleshoot or confirm such problems. Fixed time slice analysis of call quality makes it possible to pinpoint impairments in time, identify time-correlated events in the network and provide exact information about the user experience. Quality data for fixed time units also allows the user to compare and aggregate service quality information. With fixed time units, R&S®AQUA provides aggregation to MOS quality minutes, i.e. a quality rating for each minute. MOS minutes allow a very concise presentation of the overall voice service quality. The bad minute indicator (BMI) presents the number of 5-second time units that do not comply with the ED-136 requirement (MOS < 4.0) and gives perfect statistical information about the status of voice network. The BMI is the key indicator for the evaluation of ANSP voice networks and shall be as low as zero. The mean opinion score (MOS) is a scale from 1 (bad) to 5 (excellent) used for call quality evaluation. MOS historically originates from subjective measurements where listeners would sit in a „quiet room“ and score the quality of a telephone call as they perceived it. This kind of test methodology was standardized in ITU-T recommendation P.800. Obtaining subjective MOS ratings can be time-consuming and expensive and therefore quality models for MOS estimation were defined, e.g. ITU-T G.107 (E-model), which are used by passive monitoring systems. R&S®AQUA is a passive mid-point monitoring solution for real-time communications services. It consists of distributed R&S®AQUA probes and the central R&S®AQUA manager. R&S®AQUA probes receive a copy of the evaluated network via non-intrusive TAPs or SPAN ports. The probes provide real-time analysis of media streams and signaling and generate quality data records (QDRs) that are sent to the central R&S®AQUA manager. The central R&S®AQUA manager provides the business logic and the data warehouse. It retrieves the quality data from the probes, postprocesses the quality data and generates defined KPI reports and alarms.